Over 2000 sq. ft. of shop space! Get the latest Shark merchandise or order a customized jersey! All the gear you need to play your best. sharks, barracuda, jr. sharks and more! tape? skate guards? laces? we have you covered. While you’re at Solar4America Ice at San Jose, Solar4America Ice at Fremont or Oakland Ice Center, stop by our full service Pro Shop. You’ll find a wide variety of beginner to advanced level figure skating and hockey equipment in addition to clothing and the hottest Sharks paraphernalia. Take advantage of services including jersey numbering/lettering, skate-sharpening, mounting, and equipment repair. For Hockey Equipment, we are proud to be a major supplier of Reebok-CCM, Bauer, Easton, Warrior, Sherwood, Eagle, TPS, Vaughn, Shock Doctor, K1 Sports, Oakley, Center Ice, and many other product lines. Come in and check out our huge inventory! For Figure Skating we are proud to carry Riedell and Jackson Skates and Boots. We carry in stock MK, John Wilson, and Ultima Figure Blades, includign Matrix Supreme, Gold Seal, Gold Star, MK Professional, Coronation Ace, and many other models of blades. We also carry Mondor tights and dresses, Chloe Noel, Zuca Bags, Bunga Pads and other accessories. Check out all three of our locations in San Jose, Fremont, and Oakland for the best and widest variety of choices in the Bay Area! 1. For every dollar you spend, in any of our three Solar4America Ice Pro Shops, your account will automatically accumulate an additional 5% on every dollar you spend. This “additional credit” will be added to your CLP account at any of the 3 Sharks Ice locations. Every time you reach $1,000 in purchases, you will automatically receive a $50 credit on any future purchase. No Cards, no hassle. Simply register your Name, Phone and e-mail and we will be prompted every time you hit the $1,000 levels. You can use all or part of your credit on the next $50 you spend! This CLP Program is good at all three Solar4America Ice pro Shops. Register at one store and you will automatically be enrolled at all three stores. Buy at anyone of our stores and accumulate your $ total. 2. No Limits. No deadline to use, or limits to accumulate your credit. It will not expire. 3. This CLP credit is in addition to our regular 10% Off “Solar4America Ice Customer” Discount. It applies to all sales and all discounts we have during the year. Every dollar you spend, you get 5% banked in our system. 4. No Cards Needed. No cards to carry around, no card to lose, no membership # to remember, no hassle. Just give us your name or phone at time of sale and these programs will be tracked to your personalized account. 5. Free Skate Sharpening Coupon: After 9 sharpening’s, you will receive a coupon for one free skate sharpening. 6. Price Match Guarantee: Guaranteed match of internet pricing for any item priced at over $50 retail. We will be constantly monitoring and changing our “Sticker Pricing” on all items priced at over $50. This means our sticker prices will be based off the Internet match price, before our customer benefits kick in! If it is not matched or lower, simply let us know, as you can show proof on your “IPhone” and we will make the change immediately on that sale! 7. We also have our new CUSTOMER VALUE CARDS available for use at all three Sharks Ice Stores. You can put any amount you want on the card and use it like a credit card in the Pro Shop. You could even let your child use it instead of cash. It can be re-loaded at anytime. Ask about it in the Pro Shop. Solar4America Ice at San Jose has the new revolutionary designed skate sharpener. It contains a variable speed spindle that maintains constant surface feet per minute for optimum grinding action. The new front feed system with integrated linear bearings along with the granite top for accuracy and durability makes this machine perform a precision skate sharpening. With this state of the art machine, Solar4America Ice will continue to offer sharpening at the same low prices we always have. For more information in regards to pricing, please call our Pro Shop at 408-999-6761. Available for all Solar4America Ice Adult League Teams. Customize a new set of jerseys for your team. Design any logo you want and we will work with you to find the perfect jerseys, socks and pant shells for your team. We will provide you a proof and price quote for each product, for your approval. Guaranteed lowest price you will find for the same set. No charge for proof or quote. If you want to proceed with the we charge a 50% deposit at the time of order, with the balance due when you pick up. Contact Ron at [email protected] to begin your new team look! We can special order certain products. We require a minimum 50% non-refundable deposit to order the merchandise. Shipping charges may be additional. Inquire at the Pro Shop for more details. BROKEN STICKS: Solar4America Ice is not responsible for broken sticks or replacement blades. Customer must access the manufacturer’s website and follow their policies as to warranties and replacements. We DO NOT replace broken sticks or blades. NO RETURNS ON ANY PURCHASES OF DRESSES OR TIGHTS. Make sure of your sizes and styles before you buy. Hockey is a fast pace, high intensity sport, fueled by passion for the game. At Solar4America Ice we stress the importance of a safe and healthy learning environment and the need to protect oneself. We offer a full-line of the latest player and goaltending equipment, including a great selection of NHL jerseys & apparel, skate sharpening services, and more. Additionally, our Introductory Hockey Equipment Packages make it easy for new youth players to get outfitted in a complete set of gear for an incredibly low package price! Our friendly, knowledgeable Pro-Shop staff is happy to answer your questions both in store and on the phone. All helmets must be approved by the Hockey Equipment Certification Council (HECC). Facial protection although not required at all levels of play at Sharks Ice, it is recommend. This shield is either a metal cage that covers the entire face or a clear fiberglass covering that covers the entire face. Proper fitting is a must! Shoulder pads are generally made of hard plastic, which may or may not be covered in padded fabric. The front should cover the entire chest with the arm piece reaching the top of the elbow pad. Traditionally elbow pads were designed just to cover the elbow but with lighter materials and a faster game elbow pads have become larger to provide more protection. Elbow pads now look to cover much of the forearm area as well as the elbow. Elbow pads are made of hard plastic or similar materials and covered in padded fabric. When purchasing elbow pads be sure that they reach the cuff of the glove to avoid any exposed area of the forearm. Gloves are designed for comfort, maneuverability, and protection. The palm is soft leather allowing the player to feel the stick easily. The top of the glove is thick foam padding to give protection from sticks, pucks, and other hazards. Gloves should also be comfortable and allow the player to handle the stick without hindrance. For this reason many gloves have wide cuffs to allow easy movement. Hockey pants consist of a combination of hard plastic and foam padding woven into a pant shell. The pant should reach from the bottom of the rib cage to the top of the knee. The leg area should be slightly loose to allow movement and the waist should be tight to ensure they are properly positioned. Shin pads are designed to protect the entire leg from just above the knee to the top of the foot. The front of the pad is hard plastic lined with foam padding inside that also wraps around the back of the leg. Some styles of shin pads have straps to help keep the protection in proper position. If pad seems to shift then hockey tape should be used on the outer socks to keep the pads from sliding out of place. There are numerous materials used to make sticks today as well as different curves and stiffness. Basically there are three styles/options for sticks: composite, wood/fiberglass blend and shaft and blade. Composite sticks are made of graphite, Kevlar, and other strong synthetic materials designed to improve power and strength. Many refer to these as one piece sticks. Wood/fiberglass sticks are a one-piece shaft and blade that is made of a blend of wood and fiberglass. These sticks are not as expensive but break more easily than composites. The last option is a composite shaft with a insert blade. The blades are made of wood, fiberglass or graphite. Shaft and blade are sold separately and are replaceable. The next area that must be looked at is the stiffness of the stick. The greater the flex the more the stick will bend. All of the above will depend on personal preference and it is recommended that younger players look for a junior style stick. The next variable to consider is the curve. First you need to determine whether you need a right handed or left-handed stick. A right-handed shot holds the top of the stick with the left hand and the bottom of the stick with his/her right hand. The opposite would be true for a left hand shot. Whichever is more comfortable is what you should use. There are many different options when looking at curves; you may need to try a few before finding what is right for yourself. The last variable to consider is the length of the stick. Sticks are made as either Junior or Senior models. Junior models are designed for children so they are shorter and not as wide around as the Senior models. When standing on skates the stick should reach to about your chin. All sticks can be cut to you height if needed. In street shoes you should look to have the stick come up to your nose to take into account your skates. Skates are the most important piece of equipment a player wears. When looking at skates you must look for protection, stability, and a proper fit. The fit is often overlooked to get more use out of it. Generally you should purchase skates 1 to 1 _ size smaller than your shoe size to ensure a tight fit (This will differ between manufactures and between youth to adult skates). Skates should always be tied tight; not to the point where ones feet begin to hurt, but tight enough to avoid sliding or shifting in the boot. This will also avoid improper skating technique and possible injury. 10% off For all customers registered in any Sharks Ice Program. 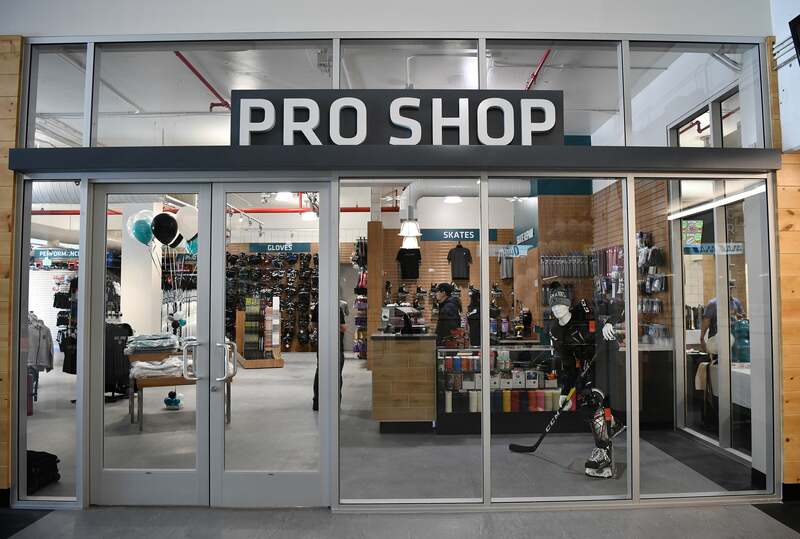 The Pro Shops at Solar4America Ice offer a full line of Hockey Equipment for all ages and abilities. For Beginners we offer the least expensive skates and equipment, without jeopardizing quality or performance. Beginner Hockey Players are required to have skates, helmet, face cage, shin pads, elbow pads, gloves, protective supporter, stick and a roll of hockey tape to begin with. The purchasing of hockey pants, and shoulder pads would follow this. Other items eventually needed would be a garter belt, hockey socks, and a jersey. All equipment listed above is available at the arena Pro Shop at a 10% discount for Solar4America Ice participants. We also have special priced packages for Beginner Goalies !!! Skate Sharpening and Skate Repair. Solar4America Ice has a wide variety of Figure Skates, Dresses, Tights, and accessories for all levels of skaters. For the beginner we have Riedell skates in the $59-80 price range. For the intermediate and advanced skaters we carry Riedell and Jackson figure skates. We carry John Wilson, MK, and Ultima Figure Blades including Majestic, MK Professional, Gold Star, Gold Seal, and Legacy among others. We also stock Mondor Tights and Dresses, Chloe Noel, Bunga Pads and carry exclusively Zuca frames and Bags. We now carry Matrix Supreme and Matrix Freestyle Blades. We will PRICE MATCH if our price is not lower than anywhere else for these blades!